Sprouts dhokla! Sounds interesting and fits in today theme of Protein-rich diet and also connects me to my last theme Simple and Healthy Vegetarian Food in Old Age! 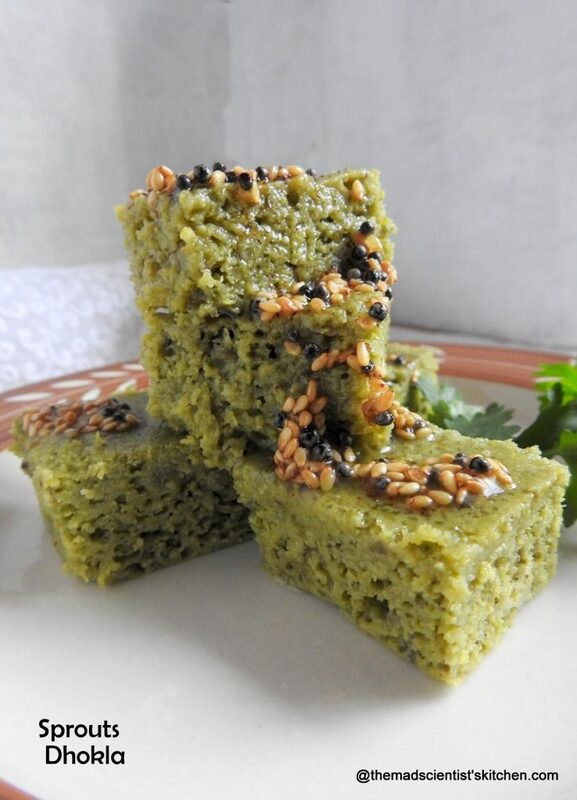 A dhokla made from sprouts I have used the moong bean sprouts and palak or spinach to make this delicious breakfast or snack. Armed with the recipe from a famous site I set about making this dhokla for Breakfast. I was so sure it will be perfect I had no backup plan. It flopped so miserably that my kiddo said she is not feeling too well and rather have fruits for breakfast. Hubby the idli and dhokla fanatic and who sees to it there are none left on the table kept looking at them and moving away. Finally, I binned them. Anyway, this became a challenge I had to make a decent sprouts dhokla something that Hubby will eat. So I mixed up two recipes(something I do very nicely), the sprouts dhokla recipe and my dhokla recipe and made sprouts dhokla. This is by no means a final recipe it needs a little more fine-tuning but since we get good palak only after the rains I am taking a short break before retrying again. The reason I am posting this is I should not forget what I have done. The other dhokla that I have tried in the past are Healthy Instant Corn Dhokla, Dhokla, Moong Dal Dhokla, Safed Dhokla or Edada, Sooji na Dhokla. The importance of sprouts in your diet is something we all know. Especially in a Vegetarian diet sprout are extremely important and you can read up here in my post Sprouts Cutlets for more information. The main ingredients in this dhokla are besan, rava/sooji, buttermilk, sprouts and palak. We have dhokla for breakfast but they make a nice starter or appetizer for a party. 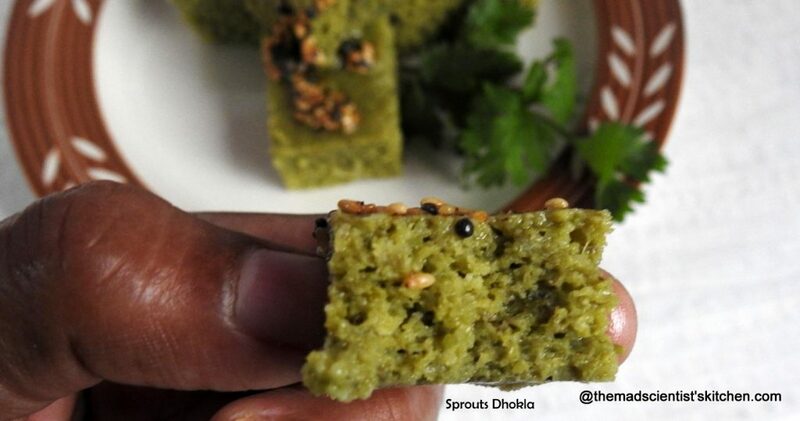 Combining the goodness of sprouts with healthy dhokla! Mix all the ingredients to soak in a big bowl as the batter is going to ferment and rise and let it stand for at least 6 hours. Grind all the ingredients under the to grind label to a smooth paste. I used a little of the batter in place of water. Mix well all the ingredients except the Eno’s fruit salt. Get your pressure cooker heated with enough water to steam the batter for 20 minutes. put the 2 tsp oil in the mould add the Eno and mix with your fingers till the Eno is well mixed with the oil. Grease the sides of the mould also. Pour the batter in the mould and continue mixing till the Eno is well mixed in the entire batter. Transfer the mould to the cooker and steam (without the whistle) for 20 minutes. 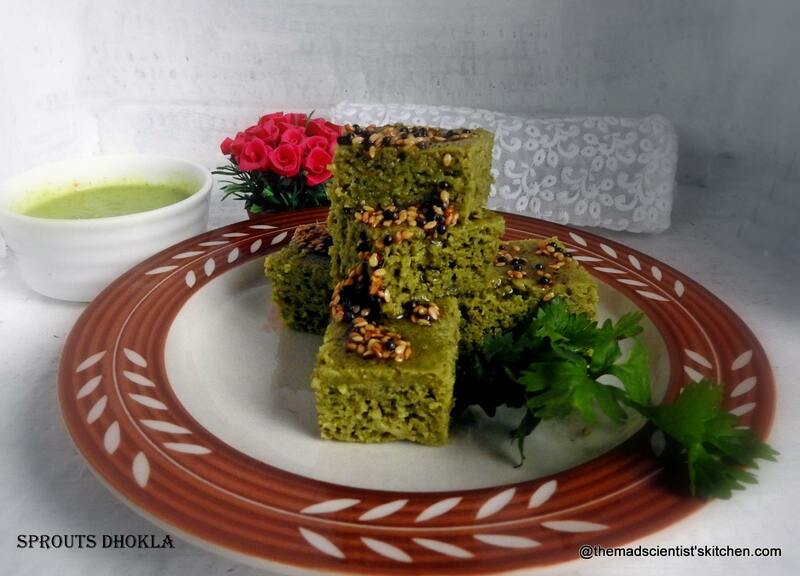 Serve topped with coriander and tempering made of 2 tblspn of oil, mustard, hing/asafoetida and sesame seeds. Fantastic ! These Dhoklas are absolutely stunning ! Bookmarked instantly . Archana you know my love for Dhoklas , every time I see a new recipe , I have to try . Since I have all ingredients and enough time , let me try them right away . Such a yummy and healthy way to include sprouts in our food.. Dhokla looks so soft and spongy!! We are a huge fan of doklas. I am planning one for today too for this Bm. Yours looks so good Archana and you have plated it so well. Bookmarking this one to try. I love doklas and this version of sprouts and spinach sounds so tempting. What a nutritious treat! wow grinding sprouts and spinach is a great idea. Can include them in any other dishes as well. Great share. I have had many dhokla disasters too. Yours look so beautiful. Fabulous idea to add sprouts and make dhokla. Bookmarking this to try. 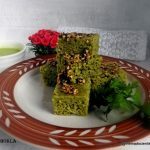 I love Dhoklas and I have tried with spinach for green, this looks so sinful and I so want it now! Wow moong sprouts in dhokla sounds very innovative and healthy addition. I would love to try them soon. Omg, moong sprouts in Dhokla, thats seriously very brilliant and very interesting. DHoklas rock Archana. Would love to have some rite now with some spicy chutneys. Beautiful Recipe. Must be one of the healthiest protein rich recipes. Love the color and spongy texture.. addition of sprouts makes more healthy and tasty. Stunning Dhoklas!! Very healthy protein filled breakfast recipe. Bookmarked! !